It’s time to celebrate! After years of protest, followed by a decade of negotiations and planning, the Great Bear Rainforest Agreements are finally in place. Eighty-five per cent (3.1 million hectares) of the remote region’s coastal temperate rainforests are now permanently off-limits to industrial logging. The ground-breaking Great Bear Rainforest agreements, a collaboration between environmental organizations (Sierra Club BC, Greenpeace, and Forest Ethics Solutions), provincial and First Nations governments, and the forestry industry, represent one of the most comprehensive conservation and forest management achievements on earth and will certainly be looked at as a model for future conservation efforts. 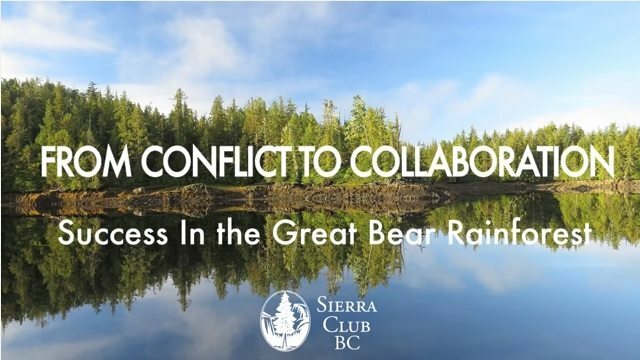 Click below to watch a video on the Great Bear Rainforest Agreements. The Great Bear Rainforest region is 6.4 million hectares, stretching from B.C.’s Discovery Islands up to the Tongass Rainforest of Alaska. Together with the islands of Haida Gwaii it represents the largest tracts of intact temperate rainforest remaining on the planet. It is the traditional territory of 26 First Nations who have lived in this rainforest for thousands of years. 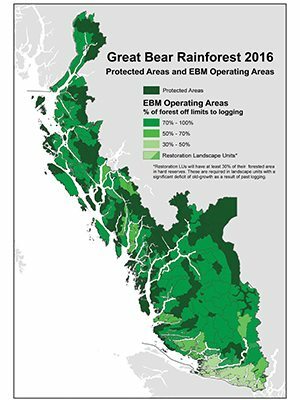 The system used as the basis for the Great Bear Rainforest agreements is Ecosystem-Based Management (EBM). EBM approaches land conservation by taking into account both human well-being and ecological integrity. This is a model that respects the limits of nature, a model the world is desperately waiting for. The majority of the First Nations in the region are part of two strategic alliances: Nanwakolas Council and Coastal First Nations – Great Bear Initiative. The Great Bear Rainforest Agreements present a model for a new relationship between First Nations and the Province. Based on a government-to-government relationship (within input from industry and environmental groups), the agreements solidify First Nations shared decision-making with the province over land use in their traditional territories. The new management framework also requires maintenance of areas of cultural, ecological and economic significance to First Nations and provide economic opportunities for the communities. Covering less than one per cent of the planet’s landmass, temperate rainforests are globally rare and today few areas remain unlogged. The Great Bear Rainforest is a remarkable example of this forest type, hosting a dense web of natural life including towering ancient trees, orcas, salmon, wolves, grizzlies, and the unique white-furred black bear, known as the Spirit bear. 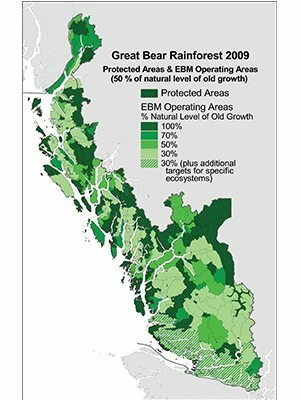 One of the most significant aspects of the Great Bear Rainforest Agreements is their impact on climate. B.C.’s coastal old-growth rainforests store record high amounts of carbon per hectare accumulated over thousands of years and continue to sequester carbon. Increased protection of old-growth will result in an immediate reduction of carbon losses from logging. 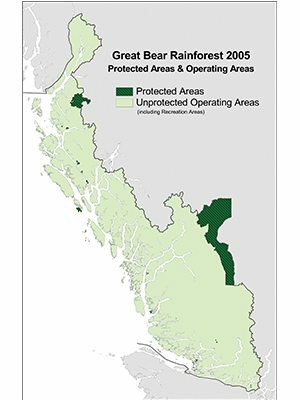 The Great Bear Rainforest Agreements set an important precedent for responsible forest stewardship. Logging in the region will be subject to the most stringent commercial logging legal standards in North America. The five members of the forest industry group that worked together with the environmental organizations as stakeholders to support the process are Interfor, Western Forest Products, BC Timber Sales, Catalyst Paper and Howe Sound Pulp and Paper. All parties involved are committed to Annual Monitoring reports and a five-year and ten-year review mechanism.